Two California Highway Patrol officers were released from a South Bay hospital after being struck by a vehicle while they were sitting in their squad car late Saturday, police said. The collision occurred on southbound Interstate 680 near Capitol Avenue. 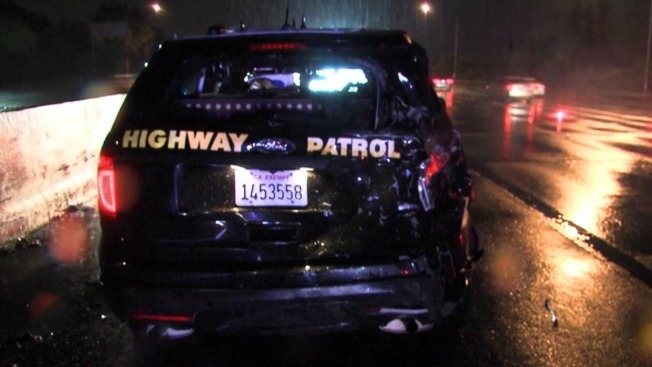 The two officers were on the scene of an abandoned vehicle when the driver of a pickup truck lost control and slammed into the cruiser, CHP San Jose Sgt. Daniel Hill said. Both officers sitting inside the police cruiser suffered minor injuries, but were released from a local hospital after evaluation, Hill said. "We were very lucky," Hill said. The driver of the pickup truck was not intoxicated at the time of the crash. Hill believes that wet conditions and unsafe driving played a role in the crash.